Why you should consider carrying white gas with you for your next camping trip. Why white gas easily puts to shame other fuel gases. How to steer clear of frostbites and other health hazards when handling liquid fuels. How to correctly operate a white gas stove. Any camping trip is not complete without toasted s'mores and the accompanying roaring sound of a campfire. 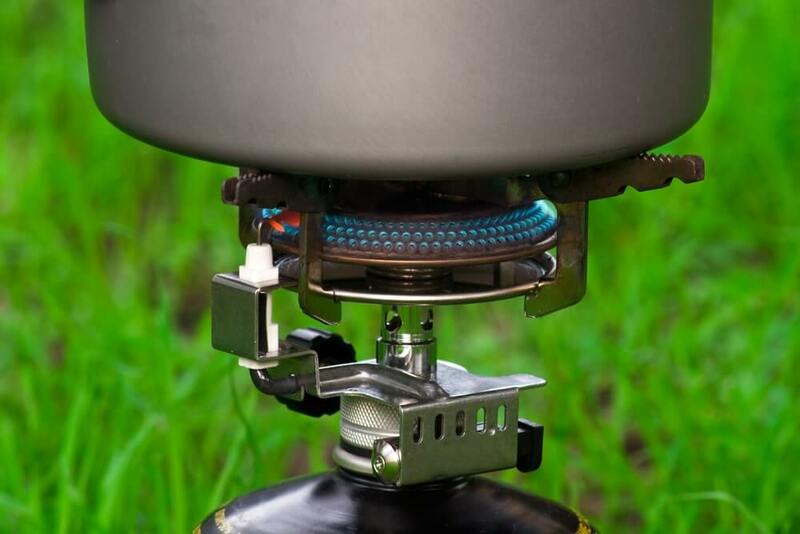 But, if you are anything close to an avid camper, then you know that a camping stove is one of the most essential camping gear. With a camp stove in mind, you need to consider the type of fuel that will power it before embarking on your adventure. Welcome to the world of the magical white gas! White gas is a colorless liquid fuel derived from petroleum. Unlike gasoline, this petroleum distillate features no additives. Usually sold in one-gallon gas cans and under its chemical name 'naphtha', white gas sports a high carbon content of 5 to 9 carbon atoms per molecule, making it a great source of energy. 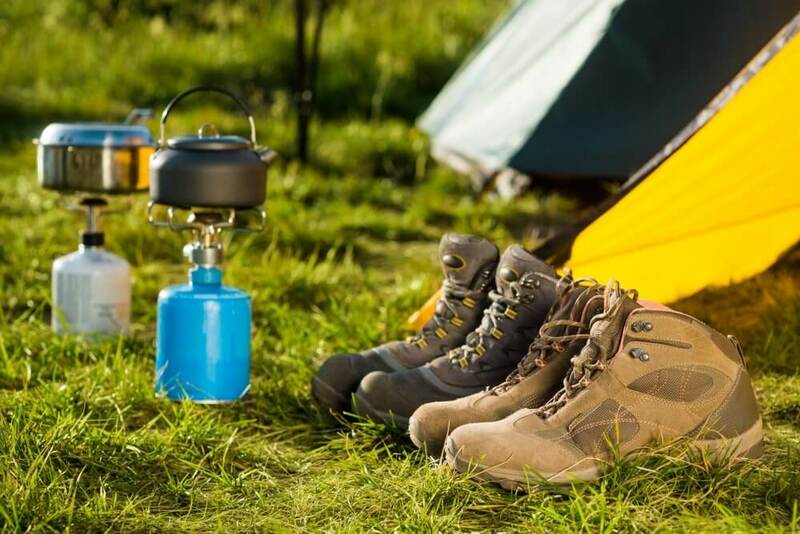 White gas is generally produced by Coleman, the famous producer of outdoor camping gear such as camping stoves, sleeping bags, tents, coolers and lanterns. This camp fuel that is in liquid form at room temperature was invented in the 1950s and first used in cars. Currently, it is a popular addition among any backpacker's gear for reasons that we will be sure to revisit later in this article. Still wondering why white gas is a popular choice among campers? It's simply because it has the ability to meet the most essential camping needs. Experienced campers will agree that food, warmth and safety are second to none in terms of importance while out in the woods. White gas has an unmatched ability to burn hot, fast and very brightly. 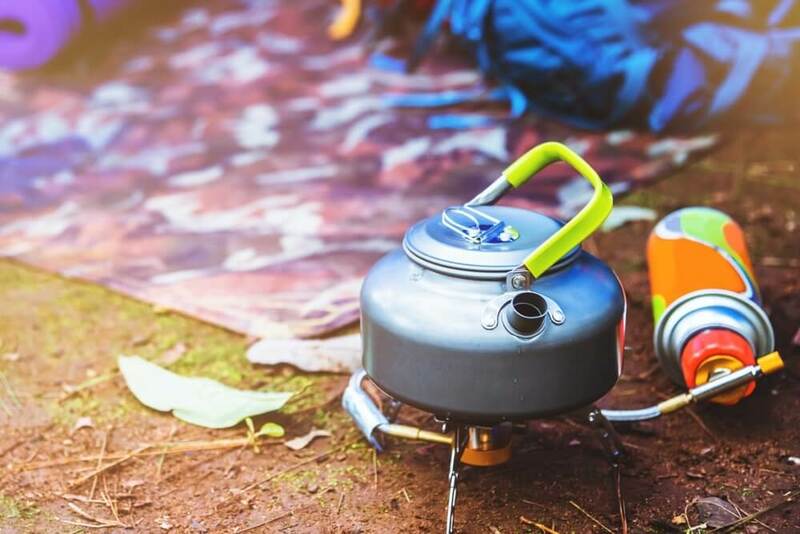 That is why this camp fuel, generically known as Coleman fuel, is popularly used by avid campers as a camping stove or lantern fuel for lighting and cooking. Other than cooking and lighting, white gas is also used by fire artists for fire dancing as it readily lights when a flame is in its vicinity and easily extinguishes as well. Now that we have established the uses of white gas, we will look into how the gas works to accomplish these aims. For purposes of this article, we will delve into the mechanism of action of white gas in liquid fuel stoves. The most popular type of fuel for nearly all liquid fuel stoves is white gas. However, before getting into the nitty-gritty of lighting a white gas stove, you need to first establish the parts of the stove. Liquid fuel stoves consist of the following main parts; the fuel tank, pump, valve and the burner. The purpose of the tank is to hold fuel; while the function of the pump is to cause enough pressure resulting in the flow of fuel. The valve then connects to the burner through the fuel line to release and control the flow of fuel. The burner ignites the fuel for cooking to take place. White gas fuel tank is pressurized by a pump system. To get the fuel to work, you need to pump up the fuel bottle/tank to generate pressure. You will need up to 10 pumps for smaller tanks and 15 to 20 pumps for bigger tanks to generate sufficient pressure. The valve will then release fuel into the fuel line. Once the pressurized liquid is flowing, it glides through the fuel line into the burner. At this point, the fuel is still in liquid form. You then need to prime/pre-heat the stove by burning a little alcohol on the burner. This process may involve the use of alcohol to keep the stove soot-free. Note that the purpose of this heating is to convert the liquid fuel into gas. Next, ensure that the lighting lever located on the side of the valve is facing upwards untill the flame turns blue. The purpose of this is to allow more air to mix with the fuel resulting in faster ignition. Once primed, the lever should be turned into a downward position. The burner then mixes the fuel with air, resulting in a chemical reaction that vaporizes the liquid fuel into a gaseous fuel. The gaseous fuel is then released for it to ignite. Although, liquid fuel stoves work their strongest when powered with white gas, lighting the stove requires some skill and getting used to. For instance, you should stop pumping once you have achieved a blue flame. The stove usually burns with a yellow flame as the generator assembly gets hot enough to vaporize the fuel. 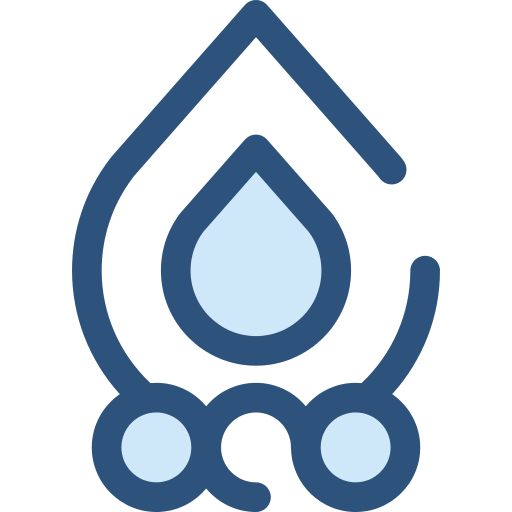 A blue flame is thus an indicator of proper mixture of the fuel and air. Having several advantages over other fuels, white gas has arisen to become one of the most preferred camping fuels. These are some of the benefits that you will be sure to experience when camping with white gas. White gas is a highly refined gas with no impurities in it. It is referred to as "white gas" due to this purity. Furthermore, the lack of additives makes the gas seem colorless. Lacking additives equates to the gas having no poisonous chemicals added. There are several advantages that can be ripped from this. To begin with, this feature differs it from gasoline and makes it much safer and easier to store and transport. Secondly, being one of the purest gases, white gas resists gumming. Clogs on the fuel line of your stove will definitely be minimal as compared to other fuels such as kerosene. The advantage that comes with lack of clogs is that you will be able to partake in other enjoyable activities other than cleaning while out camping. More importantly, your stove will not be prone to flaring or burning. Thirdly, white gas produces no aftermath soot on your stove. Soot usually appears as a result of additives which diesel, kerosene and unleaded fuel have. Lastly, when cooking with white gas you will be sure that the fuel has no effect on the taste of your food. Gases such as propane usually produce heat, light and carbon dioxide when burnt. The water vapor then has a slight impact on the taste of food, a problem that white gas does not have. Another benefit of white gas is that it burns very brightly to provide good night vision. For this reason, it is popularly used for lighting lanterns which are a necessity during those camp nights in the outdoors. White gas is also usually used as a good source of warmth in lanterns. Camping nights are known to have an extremely cold nature. This fuel is thus best for winter camping as it burns very hot producing high energy and thereby providing the much needed warmth. This feature also makes white gas the hotter gas in comparison to propane. Put it this way; if heating the same amount of water, you will end up consuming less of white gas and more of propane, to end up with the same results. This is because white gas emits higher energy. With this fuel you get to save on time. Not only does white gas burn hot but also fast; hence it is appropriate for cooking and boiling water during camping when you need to participate in a host of other activities. This same ability to burn fast will save you from dehydration during winter camping when snow is the only fresh water source as it will quickly melt it. The convenience of Coleman fuel stoves is enhanced due to the fact that you can control the temperature of the burner using the temperature knob. You need to be able to regulate heat in order to avoid burning your food and working with white gas has this advantage. You can easily estimate how much of the liquid fuel you will need for your trip especially after using it for a while. For instance, during summer, you may estimate that you will need 4 ounces per person per day while 8 ounces per person per day during winter camping. This estimate is especially handy as it is accurate when boiling snow for water, an activity that usually takes up more of the fuel. Additionally, you can always tell how much fuel you have left by simply peering into the fuel bottle unlike with propane where your best bet is to consider how heavy its cartridge is. Another convenient feature is that it is easy to refill white gas fuel bottles. The process simply involves pouring the liquid fuel into your container. In comparison, small propane canisters are hard to refill. Although you have to purchase a fuel bottle for Coleman fuel, discarding it isn't hard. With propane canisters, your only resort is to trash the canister into a landfill as you cannot refill it. Because campers may seldom need to dispose of white gas containers, this features gives the fuel a low environmental impact. As a bonus, you can also customize the containers in terms of shape and size to fit your needs and reference. You will realize that cold temperatures have no effect whatsoever on the performance of white gas as it performs exceedingly well in both high and below freezing temperatures. White gas has a low flash point. The flash point of a chemical substance refers to the lowest temperature where enough fluid can vaporize to become a combustible gas. A key feature of white gas is that it's able to vaporize easily and quickly no matter how low the temperatures fall. This makes the process of igniting the stove very easy. With it, there will be no need to abandon winter camping for the next season. To support this, the gas is easily found in North America, infamous for its extremely low temperatures. Note that although this gas evaporates quickly, it is still highly flammable and volatile and can easily fire around any form of ignition. Thus, great caution is still required when handling it. The nature of white gas is that it is colorless and odorless. Thus in case of any spillage, you will be sure that no smell is left behind. This can however also work as a disadvantage as there is no sure way of telling if there is a leakage other than depending on your sense of sight. In a worst-case scenario, the gas may ignite causing an explosion if there is a leakage around an open flame. The simple design of liquid fuel stoves is such that there are no extra parts that add to the bulkiness. Only encompassing stove essentials such as a burner, gas connection and an internal gas line; white gas stoves are not weighty. Furthermore, Coleman fuel bottles are easy to carry. Although you will have to discard white gas containers, their weight is insignificant. These two features make white gas easily portable. In comparison, propane cartridges are much heavier and add to the overall weight of your gear. Furthermore, because they are not disposable, that means that you have to carry the canisters back with you. White gas thus stands at an advantage especially when backpacking whose fundamental rule is that "every ounce counts". Therefore, the lesser the weight the better for them. Experienced campers opt for the durability of this fuel as white gas can last between five and seven years when the bottle is unopened. However, its shelf-life depreciates once it is opened and exposed to air. With proper storage in a cool and dry place, an opened white gas container can last up to one year. It is advisable to buy the gas in small containers as the fuel depreciates once exposed to air. Thus, the smaller the container the lesser the amount of fuel that is exposed to air. You will be pleasantly surprised by the easy accessibility of this gas, especially in the U.S. where camping is a famous pass time. The fuel is readily available in most camping stores hence you need not worry about the supply running out. Another plus is that many liquid fuel stoves can use alternative fuel sources. This is especially helpful when you are in a country where white gas is not easily accessible. Just like other products, cost is always a determining factor. White gas is relatively inexpensive, easily accessible and in the long-run because it burns hotter and faster you will end up consuming less of it in comparison to other fuels. Although white gas is easily one of the best camping fuels, it is not without its shortcomings. Experienced campers know that it is a bit complex to work with the appliances that white gas powers. Although liquid fuel stoves are usually simple in design, it takes more time to start them up as compared to other fuels as white gas stoves require pumping before actual use. Unlike other stoves which are usually pressurized, pumping is necessary for white gas stoves to put the fuel under enough pressure to rise to the burner. Familiarizing yourself with this process is perhaps the hardest part of working with white gas. Priming is the process of pre-heating a fuel that is liquid at room temperature so that it turns into gas. White gas stoves require that the gas is vaporized for it to burn correctly. Other fuels do not require priming hence this puts white gas at a disadvantage. Being liquid at room temperature, this fuel is prone to spillage, and in case of any leakage then an accidental explosion may follow. Hence, white gas has to be stored away from flames. As an extra precaution, you are also advised to check for any leakages as the fuel's odorless nature makes it even more dangerous. The last demerit of white gas is a by-product of working with liquid fuel stoves. When working with multi-fuel stoves, other fuels which have impurities, may clog your white gas stove parts such as your fuel tube with time. This may result in the stove flaring up, a case that wouldn't be if you were to use white gas solely. Why Is White Gas a Better Fuel Choice for Backpackers? In this section, we will compare white gas to other fuels to establish why it is a better option for backpacking. Other than white gas, the other top choices of winter camping fuels are usually kerosene and butane. With white gas, you will not need an alternative source of fuel when camping as it works efficiently at 0°C. In comparison, kerosene is a cheaper alternative but it has an unpleasant odor and doesn't produce as much heat as white gas. On the other hand, butane lights quickly with no need for priming. It also burns cleanly. However, it does not burn as efficiently as white gas in cold temperatures nor is it as intense. Therefore, if you plan on backpacking, white gas should be your go-to as it works well in spite of any changes in temperatures. Another feature that makes white gas ideal for backpacking is the fact that you will have to deal with less weight if you decide to carry it as your camping fuel of choice. This is because its storage containers are compact and lighter than that of propane. Propane canisters are cumbersome, not easily disposable and not as environment-friendly. Akin to other petroleum products, white gas is quite detrimental. One of the most hazardous features of white gas is its high flammability. This volatile nature presses that one is careful when handling the gas. Much like other petroleum distillates, Coleman fuel health hazards include minor burns, redness and swelling of one's body tissues upon contact. Short term skin contact can result in mild irritation while long-term contact is more hazardous and may result in chronic dermatitis or systemic toxicity. On the other hand, you may experience burning tearing, swelling and redness of the eye if it comes into direct contact with the fuel. Although white gas remains the first choice for many campers, there are a couple of safety measures that one should take when handing the fuel. Always use white gas in a well-ventilated area. You should not cook in confined areas such as inside tents. This is because the fuel may emit poisonous fumes that could lead to carbon monoxide poisoning. To prevent leakages, ensure that the knob connecting the Coleman fuel cylinder to the stove, is tightly secured. Always operate the stove on even ground to avoid tipping over and potential harm. Before lighting your stove, be sure to check parts such as its fuel lines, valves and other connections for leakage that could lead to accidental explosions. It is not advisable to fill the fuel tank to the brim as you need to leave room for the air you are pumping in to pressurize it. The case is so because fuel expands as it gets warmer and filling the tank up bars any room for expansion. The air space is thus necessary to deter excessive pressure buildup in the tank. Avoid spillage of white gas fuel on bare skin especially in extremely low temperatures. This can result in frostbites. At cold temperatures, fuel can drop below their freezing point yet still remain in liquid form. The fast evaporation of the gas when it comes in contact with your skin can result in frostbite. Do not use it in your camping generator or for purposes of fueling your car as it is not made for such use. Furthermore, most generator engines are designed to work with additives which white gas lacks. Using aged white gas is not advisable. However, if you have to use it then you should take extra measure to filter out any impurities that may clog your stove. Take regular maintenance measures to troubleshoot fuel tank, burner and generator problems that could hamper the performance of white gas stoves. Because of the volatile nature of white gas, its storage cans should be stored in a cool, dry place and away from any heat source to avoid explosions. Additionally, you should empty the fuel tank first, if you plan on storing your stove for long periods. This will bar any accidental explosions before you embark on your next camping adventure. Coleman fuel will definitely make your camping experience much more comfortable and enjoyable. With advantages such as having an undisputed cold weather performance, it earns an advantage over other camping fuels. The fuel is liquid at room temperature and requires priming before ignition. White gas has a low flash point. For this reason it is best for winter camping comparison to other fuels. It has a rapid ignition and high energy emission. It burns brightly making it appropriate as a lantern fuel. It is easy to refill white gas containers. Its containers are easily disposable. Its storage containers are not heavy making it appropriate for backpacking. It is easily accessible within all camping stores nationwide. It is highly volatile hence various safety precautions are necessary when handling the gas. It has a lengthy shelf life. White gas stoves operate through a pump system. With great efficiency and minimal demerits to working with it, white gas is definitely one of your best bets for a winter camping fuel.